26 Weeks along so far! Every week we are marveling at how little time probably remains before the babies come. Babies are the Size of: Two butternut squashes. MY FAVORITE SQUASH. I think it might be time to make my favorite butternut squash soup — a double batch, perhaps, with some to freeze for later. How perfectly seasonal! How I’m Doing: I’m starting to feel big and uncomfortable, and right on time. Eating even a modest sized meal makes my abdomen feel incredibly huge/bloated/distended, like I have the distinct sensation that there is not room for all these babies (two of them) and all this food (a sandwich). I had a hard time tying my shoes this morning. My belly generally feels heavy. On the other hand, I’m still feeling comfortable in most other ways. My energy level is decent. I’m getting around campus fine and feeling okay at work. I hope that feeling continues, as I have nine more weeks of teaching (not counting Thanksgiving break or final exams) in front of me. 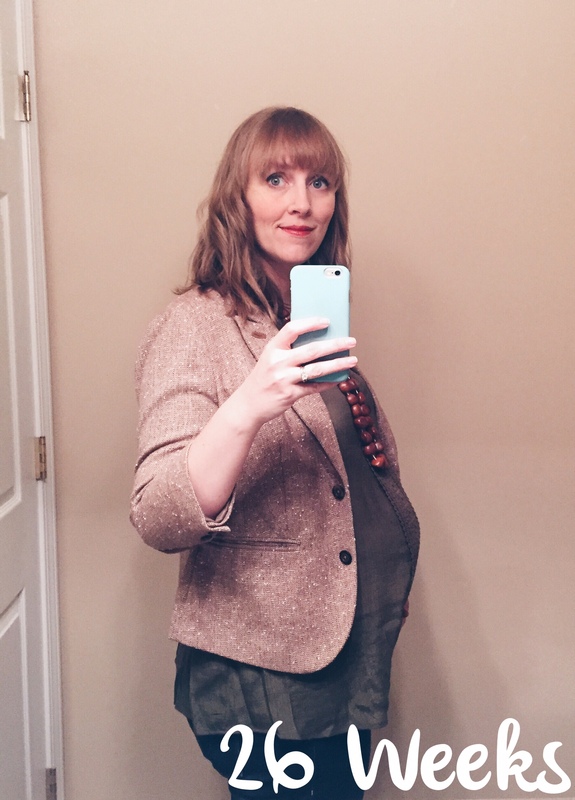 Pregnancy Perks: Have I mentioned my hair? I am not getting the hair growth/thickening/lack of shedding that they say most women experience, which is kind of a bummer, but I think I’ve got an even better hair perk: I’m just not getting greasy. This is the best thing ever. For example, I can’t quite remember the last time I shampooed, but it was definitely sometime over the weekend. Perhaps Saturday, before CW and I went out for dinner? Today is Wednesday and all I have done between then and now is wash my bangs (the better to style them) and use dry shampoo. I promise I am a) not a greaseball, and b) not smelly. My hair is just…magical right now. Hooray, pregnancy! Movement: It’s all the time now, and often even visible from the outside. Some day I will make a little video of the babies kicking me from within, but I’m waiting until it looks even more dramatic. Soon, though. Longing For: A glass of wine. A weekend with no grading or prep work. A long run in the crisp fall air. Crisp fall air at all, come to think of it. More donuts. Childbirth Class: We’ve had 2 out of 3 childbirth classes so far, and the material has covered stages 1-2 of labor (early/active/transition and pushing/delivering the baby) so we still have to talk about stage 3 (delivering the placenta) and postpartum stuff next week. This week’s class included a tour of the labor/delivery and mother/baby areas of the hospital, plus a look in the windows of the special care nursery and the regular nursery. Our hospital is “baby friendly,” so babies are only in the nurseries if they need to be. Otherwise, they are “rooming in” with their parents in the mother/baby rooms. On Monday night, the only nursery residents were a pair of twins who were doing time for feeding and growing — something it’s likely ours will have to do, too, depending on when they make their arrival. It was oddly comforting to see them through the window, so cozy and well taken care of. Still, hoping our little monkeys will stay put for another 10-12 weeks. You hear me in there?